As the bottom steps are now finished and the gardens in place, we created a new water habitat on the Plot Level. 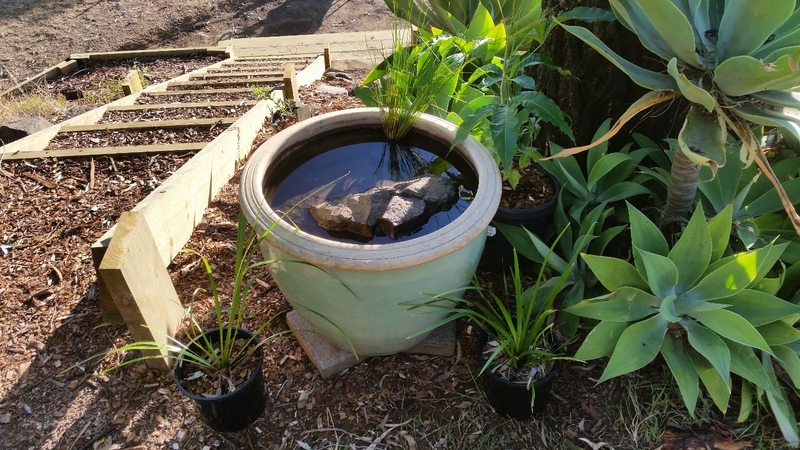 Using a massive pot (Given to us by our good friend Christine) that had a sealed bottom, we placed soil, rocks and gravel in the pot and filled it with water. This was placed next to the huge Narrow-leaved Ironbark on the Plot Level. Large rocks were placed at the centre of the habitat to ensure an ‘island’ was formed that would allow the birds and other animals a place to stand and drink safely. Birds like and/or require a safe environment when drinking from an exposed area, so we placed a small tree near the habitat and planted multiple Lomandras around the base of the habitat. This will give the birds some safety cover, and also enlarge the habitat to attract other insects and animals. We also placed Juncus usitatus(Common Rush, Tussock Rush) reeds within the water habitat. These reeds are planted in a small pot hung with wire under water in the habitat. 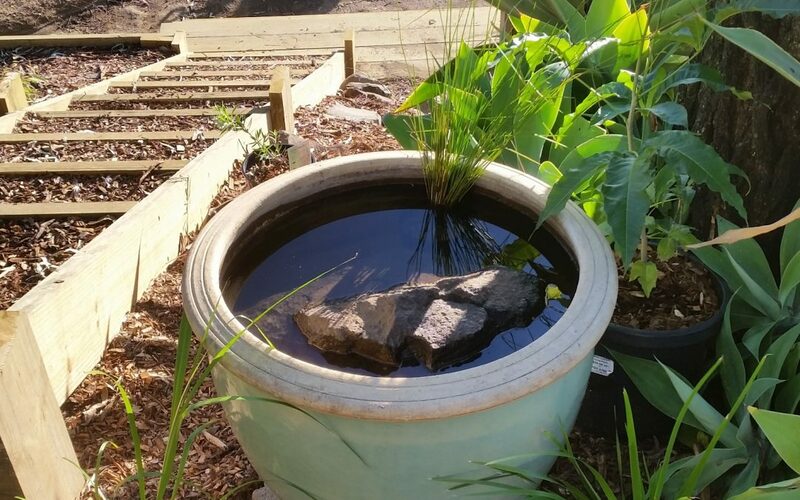 The Juncus roots will grow and reach down to the soil and rocks at the bottom of the habitat, and at a later time will will cut the plastic pot away from the reeds allowing them to grow naturally. Within an hour of creating this habitat for the birds we had native birds visiting. If you want to attract birds to your part of the world you caould put a simple water habitat like this together in an afternoon. Then sit back and relax as the local natives come to visit.